AAUW is a nonpartisan organization that promotes equity for women and girls. For the 2018-2019 program year, our Branch will utilize and strengthen our collective voices to develop local public policy priorities to support national and state AAUW priorities. 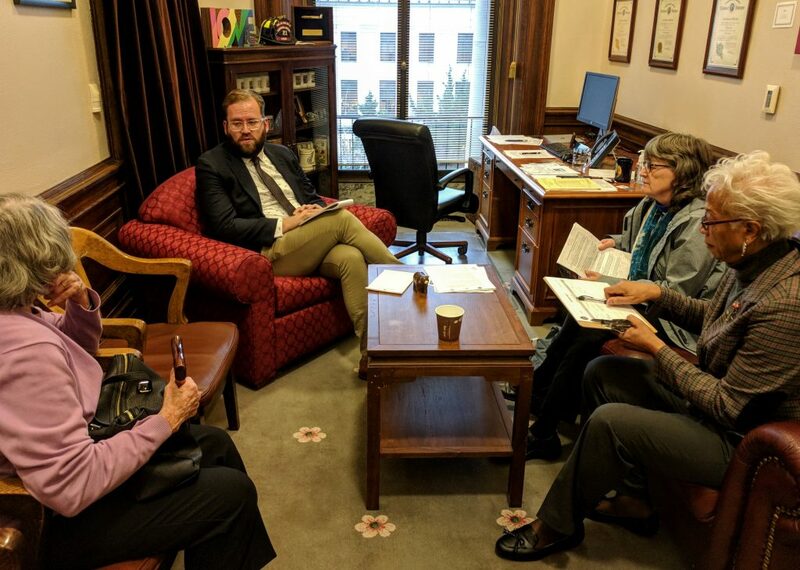 Edmonds SnoKing Branch members meet with Senator Marko Liias from the 21st District. Our Branch members reside in nine state legislative districts and three federal legislative districts. Members live within two counties and in 13 cities. Our “Branch voice” has the power to influence 27 state lawmakers (nine senators and 18 representatives). In the 2018 session, we had at least one “Branch” representative on every House committee, and on 11 committees they were the Chair or Vice Chair. In the state Senate, 12 out of 15 committees had one of our “Branch” Senators as a member and they were the Chair or Vice Chair on ten committees. By joining our collective Branch voices in support of AAUW priorities at a state level, we can make ourselves heard!